It’s been a little dead ’round these parts lately, so I think it’s the perfect opportunity to run a giveaway I planned earlier this year. I’m getting the hang of cold process soap making & I eventually want to go to market with these soap bars I’m making, so what better way to debut them than to send it to a random stranger who won them by luck? I’ll also toss in a free domain & a year’s hosting to make the package all that much sweeter. To add a cherry on top of that, I’ll even toss a few of my favorite sweet treats from Trader Joe’s & a room spray with your choice scent if you’ve had more interaction with me than just entering the contest! While giveaways are great to promote your website, I also want to reward my readers. So, come for the giveaway, stay for the recipes. This giveaway is open worldwide & anyone can participate. I would much rather have someone who always leaves me comments win over a random person who has never talked to me & will probably never talk to me afterward, win. But it doesn’t always work that way, so take a chance. If you’re already following me on social media, you can still get those points because you’re already awesome. After the jump, check out what else you might win! I know these shots are identical, but shut up because they took a lot of tears to make okay? 100% Handmade Cold Process Soap + room spray! * You’re only gonna get these if you interact with me beyond the context of this giveaway. Don’t worry boos, I got you covered. Only 5 can win these spots! * Same rule from above applies to this. I’d be more than happy to ship you some soap, but if I don’t like you, you’re not entitled to the soap. My favorite soap scent is monoi.Thank you for this fantastic giveaway! This is such a cool giveaway idea with so many goodies, Tiffany! And those soaps look mad cool 😀 Earl Grey lavender and green tea sounds like wonderful scents! I saw your Instagram post and got all excited! There is a company in Australia that makes their own crazy scented soaps, and they look like slices of cake too. And smell SO good. I think that one reason I don’t like soap (I use gel/wash instead) is because it dries out skin sometimes. I am sure you know the ins and outs of soaps and how to make them so that they aren’t dehydrating, though. Yeah absolutely! I’m sure you have tons of vendors for handmade soap. I honestly don’t know how my love for making soap happened. It just kind of did one night when I looked up how to make soap with tea & then I went from melt & pour soap to full blown cold process “mess with lye Fight Club style” soap. Like you, I’ve never been a huge fan of bar soap because they tend to be really drying, but the cheap bar soaps are like that for a reason. All the soap bars I’ve made so far have been so hydrating, it’s so surprising & refreshing! My skin feels so nourished. 😀 Besides my lips….I can also make lip balm, but I don’t want to start that up haha. I don’t think your preferences are strange at all! What person doesn’t like the smell of clean linen? I get a headache when I walk into Bath & Body Works. All of their fragrances are synthetic & they’re so overpowering. Subtle is not in their dictionary. I’ve seen really expensive soap out there, so I know how you feel. It shouldn’t cost a fortune to get clean, but unfortunately, bar soaps are expensive (at least handmade ones) because they take a lot to make & the ingredients are expensive. It’s better for your skin overall, but I do agree that it’s quite expensive. I’ve never really cared too much for handmade soap before, but then I started randomly one night….& now it’s my new favorite hobby. I think they serve as nice TREAT YOSELF moments, but just like you, I don’t think that bar soaps or shampoo bars (haven’t made one yet, but will venture into that eventually) are something you should go for 100%. I haven’t dabbled in liquid soaps yet, but I will because people love body gel, so why not, right? That’s the big thing, I think, that sometimes scents can be so overpowering that they’ll make you woozy, especially if you’re sensitive to that sort of thing. I really want to try the bar soaps at some point, and hopefully will be able to sometime soon! I had a friend tell me they’ll do amazing things for my skin, which would also be nice since I wash my hands so much sometimes they get really dry. Wow, what a great giveaway.. does this mean we will begin to see stylised soap photos from you… I’d love to see a combined food/soap combo 😀 I once bought a chocolate scented goats milk soap that looked like cheesecake. It was delicious enough to eat. 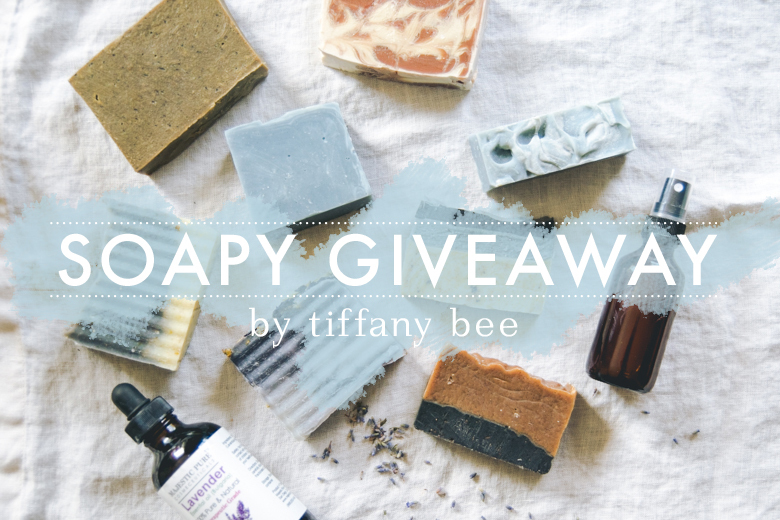 I love the look of your soaps and the idea of this giveaway! I normally get fruity scents, but green tea and chamomile sound really nice too. I like that you have bonuses for people who actually interact with you instead of coming only for the giveaway 🙂 This is also a really cool giveaway app. I haven’t seen it before, but it seems better than the usual rafflecopter that everyone uses. Good luck with the giveaway! It’s really a heavenly scent that I can’t get enough of !! Earl grey lavender sounds really interesting. I’ve never heard of that combination before. Thanks for the giveaway. i love soaps so much hope i win!! i love this soap i cant remember where its from but i had it awhile ago and it smelled so amazing i wish i could have it again. I really like a citrus scent soap most of the time. Earl grey lavender and green tea scents sound great! Love the scent of Lemongrass or any citrus scents really. I love vanilla or chocolate scent! I would say lavender or vanilla. They just smell so relaxing and well, nice! Earl grey lavender sounds really great and gorgeous! I love the scent of vanilla and coconut! I love argan and almond. My favorite soap scents are banana, coconut and mango.I love anything that smells tropical. It brings me back to my vacation to St John and that makes me very happy!! I’m into more floral scents. Rose seems to be the consistent pick even though on days when I need a mood lift, citrusy scents always work. Oh my gosh this sounds awesome. I love love love floral scents that aren’t too overpowering, so your rose and earl grey lavender scents sound amazing. I would like the clean linen scent Thanks for the chance! I always read that guys like pumpkin and lavender combined, that it gets the pheromones going. Food does it for me. Mint and citrus. But I love a good chai, or spice. I love the scent of coconut or lavender. This is an amazing giveaway! Here in Brazil we don’t have that kind of product, so i’m really excited to try them. I love Floral scented soaps. Especially, I like the fragrance of jasmine.